Gareth Bale was all smiles as he took part in Wales training ahead of the country’s crunch Nations League match against Denmark. The Real Madrid forward missed Wales’s 1-0 win in Ireland last month through injury but is fully fit to face Age Hareide’s side on Friday night. Ryan Giggs looked on as his players revelled in a training exercise that resembled British Bulldog, with groups of six holding hands trying to catch free-running members of the rest of the squad. Bale was a picture of competitiveness, grinning broadly after snaring Tyler Roberts, and raising his arms aloft in mock celebration. 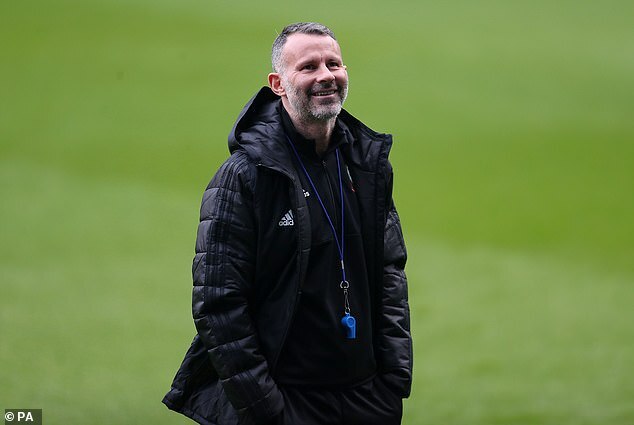 The game was the brainchild of Tony Strudwick, head of performance for Wales, who introduced it for the first time to break the tension on the eve of a big fixture. Giggs posted a positive prognosis on Bale, who had a tight groin last month and picked up a minor ankle problem playing for Real against Celta Vigo on Sunday. ‘He’s good, he’s fine,’ said Giggs. ‘Obviously he arrived a little bit later than the rest of group after playing Sunday evening. Giggs said Wales were determined to beat Denmark for more than one reason. ‘There are lots of incentives to top the group. First of all to win a really competitive group would be great. ‘Then you get a second bite of the cherry with regards to the Euros, if you don’t qualify automatically. And it has an effect on the seedings for the draw also.